One of the important parts of our savanna restoration work has been the removal of a large number of black walnuts (Juglans nigra). Although black walnut is considered a cash crop in forestry, it is an invasive species as far as we are concerned. Walnut was absent from the original land surveyor’s records for our area, indicating that it was only a minor component of the original vegetation. Because it is relatively fire sensitive, it would not have been a major component of the savanna. Black walnut is primarily a tree of the mid-continent of the United States and is at the northern edge of its range in southern Wisconsin. Here it is usually found in mixed forests as single isolated specimens, although in some restricted areas it may become dominant or subdominant. Black walnut toxicity Black walnut produces a toxic substance called juglone (5 hydroxy-1,4-napthoquinone), which occurs in all parts of the black walnut plant. Juglone inhibits the growth of many other plants, a phenomenon called allelopathy. However, tests have shown that many plants are resistant to juglone and are thus able to grow in the presence of black walnuts. Resistant plants include all grasses, and a number of woodland forbs, including jack-in-the-pulpit, bellflower, bellwort, dutchman’s breeches, wild geranium, mayapple, solomon’s seal, bloodroot, and trillium. Also, spiderwort, a common prairie plant, is resistant to juglone. Honeysuckle, an invasive shrub, is also resistant. Walnut removal at Pleasant Valley We had three areas at Pleasant Valley Conservancy that had large populations of black walnut. The first two were Units 18 and 21, that are on opposite-facing hills that had the same geology. These hills had been in pasture until the mid 1950s, after which they remained as open land. Both hills had some very large bur oaks that had been unaffected by grazing. 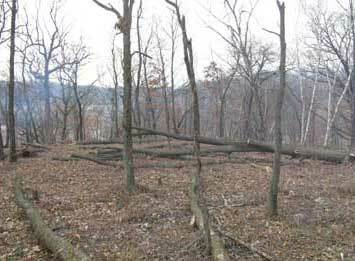 After grazing ceased, these two hills gradually filled in with woody vegetation, of which black walnut was the most common tree. The walnuts on Unit 18 were removed in the winter of 2000-2001, leaving behind a handsome stand of mature bur oaks that had survived years of grazing pressure. The residual selective toxicity of juglone after walnuts are removed may influence the kinds of plants able to become established. It is interesting that in Unit 18, spiderwort, a species known to be tolerant to juglone, developed extensively on the lower slope after the walnuts had been removed, and has remained in large numbers ever since. 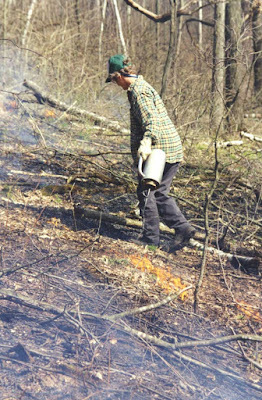 Heavy seeding of Unit 18 with native species was done in the fall of 2001, and again in 2003. Also, Unit 18 has been burned annually ever since, and these burns have been very successful burn. Although brambles were a problem, they were dealt with (cut & treat) in 2006 and this hillside has become a fine oak savanna. 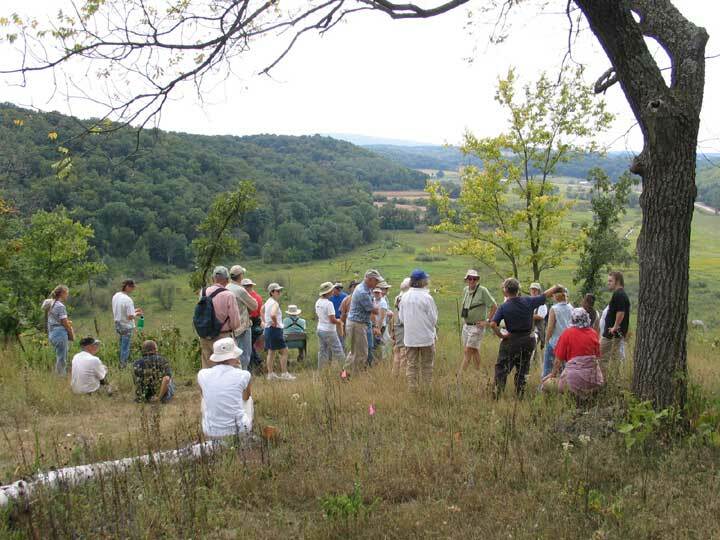 Unit 21, on the hill opposite Unit 18, is in the same geological formation and has had the same land-use history. When restoration began in January 2004, the principal trees were black walnut and slippery elm, with a number of small- to medium-sized oaks. The understory was almost pure honeysuckle. For the Unit 21 work, cold weather and moderate snow cover was favorable for walnut removal, and all of the trees were off the site within a two-week period. Many of the walnut specimens were fairly large, and were good candidates for saw logs (lumber). We took advantage of the solidly frozen ground and had these logs brought down to the town road by a log skidder. Care was taken to avoid disturbance of the soil. There was also a smaller area of large walnut trees in the ravine between Units 12A and 20 and these were cut and skidded over the snow to the road at the same time. An area of walnuts in Unit 21. There were 25 walnuts here large enough to convert into lumber. 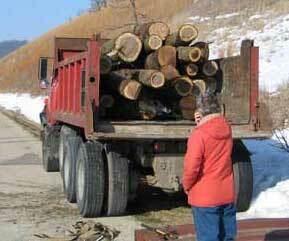 Truck load of walnut logs removed from the marsh edge. Over 70 trees were cut at this location. The Resprout Problem. 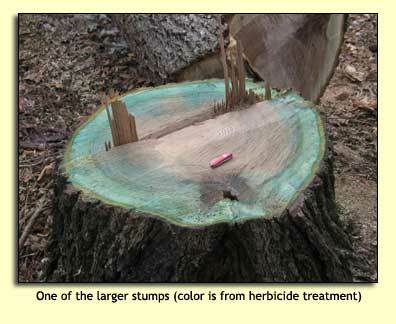 For most tree species, treatment of the cut stumps with 21% glyphosate prevents resprouting. However, this procedure was not effective for walnuts and extensive resprouting of cut stumps occurred. 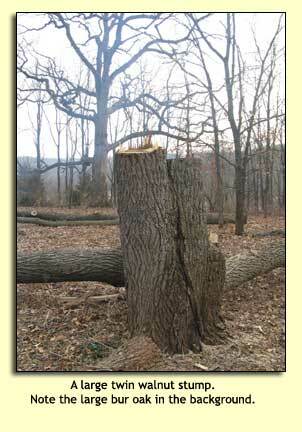 By the summer of 2002 the walnut stumps on Unit 18 (cut in the winter of 2001) had resprouted extensively. From each stump as many as 20 new shoots had developed, most from the root collar but some from the side of the stump. In January 2003 all of these resprouts were again cut and treated with herbicide. However, many of these stumps resprouted again in the summer of 2003. It turned out that glyphosate is not too effective with walnut. Switching to triclopyr (Garlon 4; 20% in oil) was the solution. In addition to treating the cut stems, basal bark application was done. Continual monitoring for walnut resprouts has been done, and the problem has been eliminated. 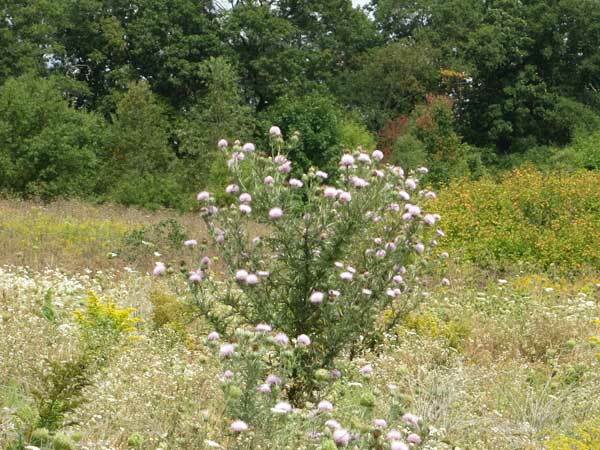 Old-field thistle (Cirsium discolor) is a favorite plant of pollinators and birds. Goldfinches love them, and many wait until the thistle plant is mature (late August or early September) to nest. At Pleasant Valley Conservancy, old-field thistle has been in our seed mix since restoration work began. However, since this thistle is a biennial, it moves around. Fortunately, seed viability is good, and colonization is generally successful. However, one hardly ever sees first year plants, which generally grow as low-lying rosettes. The purpose of this post is to show the origin of this thistle's common name. The east boundary of PVC is adjacent to a neighbor's field that has been used variously to raise cover crops for a near-by organic farming operation. Three years ago, cropping was abandoned, and this field turned almost immediately into an "old field." About three weeks ago, this field was almost a monoculture of Queen Anne's lace. Yesterday when I looked at it, a large number of old-field thistle plants had developed, more thistles than I had ever seen in one place. This field is within yards of the PVC East Basin, a five acre restored prairie that has scattered old-field thistle plants.Although thistle seeds get around very well, I suspect that most of the "inoculum" for this field came from our East Basin next door. According to Allen Stokes, who did a detailed study of goldfinch nesting in Lake Wingra marsh in 1944-1946, late-nesting goldfinches work very fast to complete their nest building and raise their young. This makes sense when one considers that in our area the weather could briefly "crash" at any time. Incidentally, visitors to PVC generally miss completely the East Basin and the adjacent Ridge Prairie, because the main trail leads in the opposite direction. Now would be a good time for a detour in this direction. 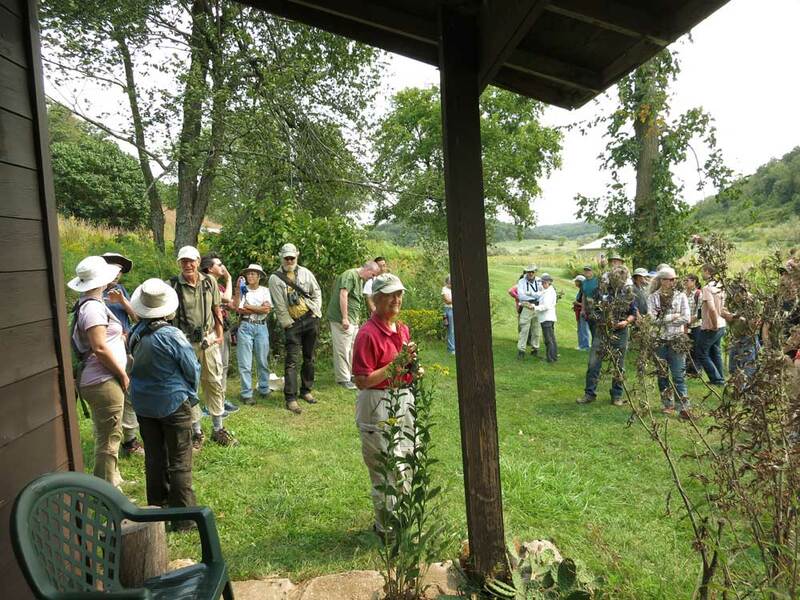 Kathie and I have been leading a Labor Day (1st Monday in September) field trip at Pleasant Valley Conservancy since at least 2002, possibly a year earlier. (I have sign-up lists going back to 2002.) Labor Day seemed to me then, and still does, an ideal time for a trip. Everyone is off work, the prairie grasses are in full bloom, and there are lots of great forbs in bloom. The attendance that we have been getting seems to agree with me. In 2002 we had 15 attendees, and the number has been increasing ever since. Last year (2016) we had 35 and this year 45, which is the largest we have ever had. Since this has been a wet summer, it is not surprising that the prairie grasses are really lush. The Indian grass and little bluestem on the South Slope were at their peak, and it was a joy to watch them blowing in the wind. Some people don't like a prairie dominated by warm-season grasses. 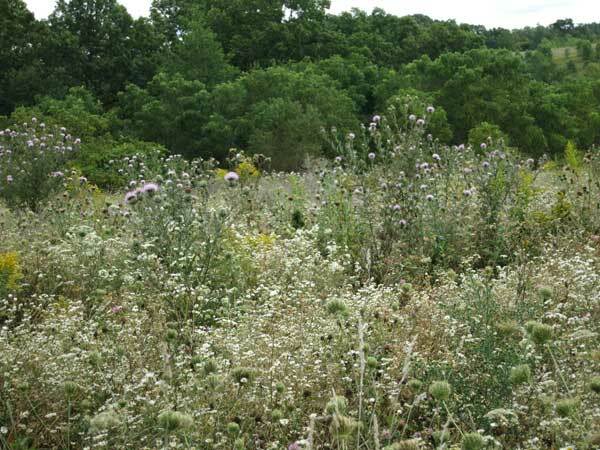 I made the point that in mid-July the South Slope is a forbs-rich prairie, and forbs and prairie grasses get along very well together. See this link for a discussion of this point. We generally get a few demon botanists on this trip, and this year was no exception. Scott Weber and Muffy Barrett, Chris Noll, and Raymond Roberts were all finding things that Kathie and I did not know we had. The prize this year was northern slender ladies' tresses (Spiranthes lacera), found by Raymond right off the trail. (At PVC last year, a week after Labor Day, Scott had found Spiranthes ovalis, another rarity.) These tiny orchids like disturbed grown, and most of our vegetation is too lush for successful habitation. Labor Day 2005 trip pausing at the Far Overlook. Part of the 2017 field trip group. This year we started and ended at the cabin. 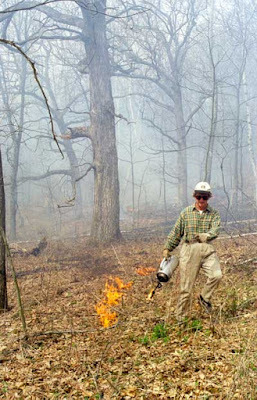 Oak savanna restoration: when should the first burn be done? When the first oak savanna burns were done at Pleasant Valley Conservancy in 1998 they were unsuccessful. The fire moved a few feet away from the drip torch line and then stopped. At the time we were told that “there aren’t enough oak leaves”, and this is why the fire did not carry. The reason the fire did not carry was because of all the coarse woody debris on the forest floor, and the dense tangle of living shrubs, mostly prickly ash, especially visible in the first photo. The fire movement is blocked by all the woody debris. Also, each standing woody stem blocks the movement of fire, and takes up space on the forest floor that would otherwise have a layer of oak leaves. 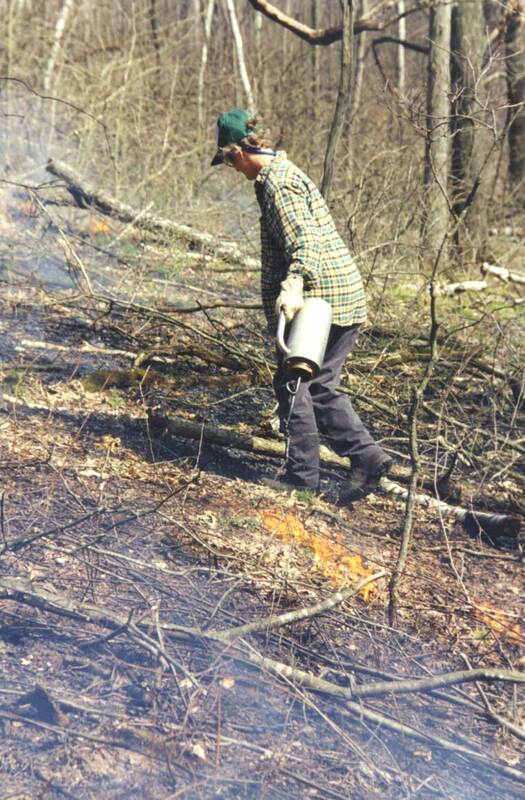 Trying to burn the White Oak Savanna, April 1998. Note all the coarse woody debris and the tangle of brush in the background. So why were we trying to burn? But oak savannas are not prairies. Degraded oak savannas have a heavy legacy of shrubs and coarse woody debris. We should never have burned anyway, because the fire would not get rid of the living shrubs. All it would do was top-kill them, and each plant would resprout from the base and send up new shoots, often a lot of them. Indeed, burning had the potential for doing more harm then good! What we should have done was to clear the shrub layer (cut and treat with herbicide) and remove all the trees that were fire-sensitive and hence would not have been part of the original oak savanna. This was actually a central goal of the management plan, but the urge to burn was pretty strong. And this is what we did do, starting in these savanna areas in 1999. 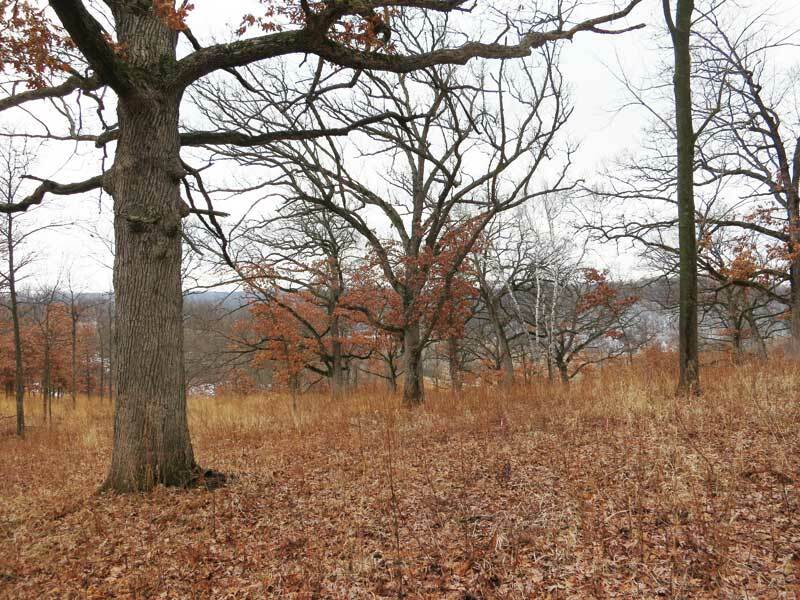 Incidentally, the savanna shown in the photos is what we call the White Oak Savanna (Unit 12A/B). The photo shows what this savanna looks like in 2014, after clearing and annual burns for over 10 years. Now, when this savanna is burned, the fire carries very well! White Oak Savanna in 2014, after over 10 years of annual burns. These are the same trees that provided oak leaves in 1998.